About two months ago I contacted a well-known, local dance studio to see about enrolling Maya in formal ballet / tap classes. She is very theatrical and into pretend play, loves music and dance right now, and I thought it would be good prep for kindergarten in a couple years: unlike school or the activities we’ve done with her friends, she wouldn’t know anyone (teachers or students). Also, she’s at the prime age to give it a shot: I had started dance at age 3 and danced til Varsity cheerleading conflicted sophomore year of high school — starting young was a huge benefit in terms of learning discipline, building confidence, making new friends, and of course, the physical aspects of dance. 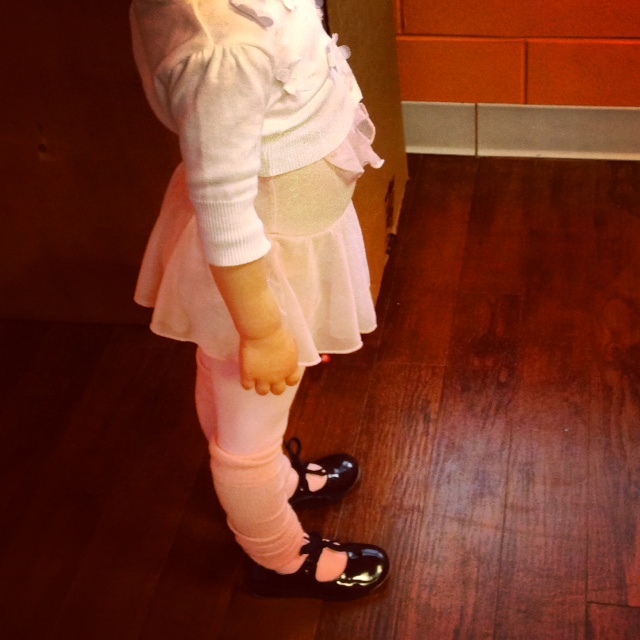 Based on our availability and Maya’s age, the class the director recommended was Pre-Ballet / Pre-Tap, ages 4-5. Maya doesn’t turn 4 til 12/18, and so I was a bit hesitant about her age, maturity level necessary for the class, and even size (there was no question she’d be the youngest, the smallest, and — since classes began technically in September–the most novice). Still I figured we’d give it a go. A couple weeks ago I told her about starting her class, and took her to the studio to get fitted for teeny tiny tap and ballet shoes. We watched some classes in action and she loved the studio — especially the play area for siblings out front 😉 I showed her where Mommy would wait during each class and she seemed to get it (this would be her first non-parent class). At home, we did a couple test runs in her studio’s uniform for her class: pink leotard, pink tights, shrug if desired. For kicks I dug up a pair of sparkly pink leg warmers I had gotten her like two years ago and let her practice in her taps. She asked me to be the teacher and I happily obliged (OMG I am that mom, re-living my youth through my kid … !). And then the next day told me she didn’t want to go to ballet. Um, OK? Tough breaks, kiddo! Last Saturday was supposed to be her first class. I got her dressed, listened to her “I don’t want to go” protests during the 15-min. drive, and then her excitement at what she would do there. (Preschoolers and pregnant women have the same caliber of mood swings, I’m convinced!) We got inside the studio — in the pouring rain, mind you — only to find out that her teacher was sick and, because we weren’t in the computer yet, they hadn’t known to call us. I tried to contain my disappointment/annoyance. Maya appeared bummed for like five seconds. “OK … next week then. So can we go to Benny’s swim class now? I want to swim!” So we went to the Y, where Luis and Ben had swim class, and she swam during open swim. Yesterday was the real deal. We got inside about ten minutes before class, and her fear of the unknown was written all over her face. My hand hurt from her gripping so tightly, and I couldn’t help but put myself in her tiny shoes. New places still intimidate me, and I’m 35 and a grown-up! But as soon as we got to the waiting area, a little girl ran up to her. “MAYA!” Turns out she goes to Maya’s school in the afternoon — so she would know someone, after all!!! (Kalamazoo is pretty small, we’re learning!). She was happy to see her friend and warmed up a bit, but still clung to me while the students began arriving. Right before class, her teacher came out and told the girls today would be tap (it alternates each week). I introduced myself and said today was Maya’s first day — and her teacher was just wonderful with her. In fact, when it was time to go in, she carried her in — recognizing she needed the push. I could hear Maya whimpering, but knew I had to back off — even though it killed me. For as sassy and precocious as this kid can be, she’s still three (almost four) and immature; she’s still very much a little kid: not a baby, not quite a big kid … that in-between stage of wanting independence and being afraid in new situations. I didn’t realize the kids couldn’t see out the door (but we could see in) so I was hesitant about hanging out near the door and only walked by a couple times when I couldn’t stand the suspense. I know it’s silly, but I just feared seeing her sitting in the corner, not at all participating. Instead, I saw her tapping two-by-two down the room, playing with musical sticks, and singing to a song about knowing her left foot from her right foot. And though she looked serious and a little scared the first time I peeked, she looked happy the other times I “happened” to walk by. In many ways, I’m glad she couldn’t see me. It’s important for her to have experiences on her own. And she might tell me she didn’t like it, but I can see otherwise, which was comforting. I had to hold back tears — I was so proud of her, but it was bittersweet, too; this was the first experience she didn’t “need” me for. At the end of class a couple other moms were hanging by the door (they confirmed the kids cannot see out!) and I introduced myself and said that today was my daughter’s first day. They asked which one she was and when I pointed they said, “Oh my gosh, she’s adorable–she’s so tiny! !” and they assured me she would love it; that their daughters took a couple weeks to warm up and now are constantly dancing and showing off their routines. After class wrapped up, all the girls got a sticker in their sticker book and the door opened. Maya came bounding out with THE biggest smile on her face. She told me she DID like class, but it was “really loud.” “I was a little bit afraid of the noise.” But overall, she seemed to love it and was eager to talk about it — which is good because recital costume deposits are due in a couple weeks for her June recital. Her teacher assured me she did great; that she observed a little and hung back a bit in the beginning, but also participated and seemed to enjoy herself. I gave myself a silent high five: she had experienced her first no-parent class, and she’d done FINE. I’m sure she will fight me some days (as she still sometimes does to us at school drop-offs– which she loves!) but we passed that first class … and she did it! I took her to the Y after class where we met Luis and a happily splashing and kicking Benny. Usually she holds Luis’s hands and jumps in if she isn’t wearing swimmies, but yesterday — after a LOT of prodding — she finally nailed the solo jump in (he was there to catch her). What can I say, she was feeling brave and feeling her oats! We were both super-proud. What’s interesting to me is I’m realizing I’m much more of a trial-by-fire parent than I thought I’d be — and that’s just what this kiddo needs. Once she has the prod — she believes she is capable of anything. And I love that about her. My fearless, tiny dancer. I hope she loves it … and if she doesn’t, that’s OK too. I’m just glad she has this new experience to look forward to. After class … all smiles! Dance class and swimming in one post?! LOVE.